Best practices and innovative solutions are available for business processes, policy decisions and engineering problems. 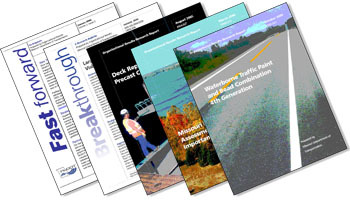 The Innovation Library lists all of MoDOT's online research publications by date. Publications may be available in printed form by e-mailing RDTcomments@modot.mo.gov or calling 1-888-Ask MoDOT. More transportation related documents are available in the MoDOT Transportation Library that is partnered with the Secretary of State's, Missouri State Library. MoDOT's "Fast forward" publication covers innovative business, policy and engineering solutions as well as the latest research and success stories.